It is fair enough for people to ask why the Orthodox Christian faith inspires our loyalty. There are so many other religions available to us, as well as non-religious perspectives according to which we could live our lives. We are free to believe and live as we choose, so why should we identify ourselves with Jesus Christ and His Church? From the earliest years of the faith, the example of how personal encounter with the Savior changes people has been a powerful witness. The early Christians laid down their lives for Him as martyrs. They shared their possessions such that the needs of every member of the community were met. They crossed ethnic boundaries in shocking ways that manifested their unity in Christ. They cared for the sick during plagues and rescued children who had been abandoned by their parents. In contrast to a decadent culture, they embraced chastity in a way appropriate to their vocations as married people, monastics, or widows. The shocking transformation of Zacchaeus serves as testimony to the healing power of Christ in relation to some of the most powerful temptations that we experience. Recall what St. Paul wrote to St. Timothy about the dangers of loving money: “Those who want to get rich fall into temptation and a trap and into many foolish and harmful desires that plunge people into ruin and destruction. For the love of money is a root of all kinds of evil. Some people, eager for money, have wandered from the faith and pierced themselves with many griefs.” (1 Tim. 6:9-10) It is one thing to be content with having the physical necessities of life, but quite another to seek the meaning of our lives in the comfort, status, and security usually associated with wealth in this world. Personal experience teaches that possessions easily become our false gods, but they cannot ultimately satisfy us. Wealthy and famous people may live in misery, while the humble poor may experience great joy. Those whose lives revolve around money and what it can buy will never be at peace, for there can be no guarantee about what tomorrow will bring. No matter how much or how little we have, worrying about keeping it and acquiring more often enslaves us to self-centered desire and obscures our vision of the needs of others. It turns our trust away from God and toward an imaginary vision of ourselves as being self-sufficient. When, like Zacchaeus, we open our disordered relationship with money to Christ, we will turn away from self-centeredness to embrace generosity toward others. To live that way in the midst of such a materialistic culture will bear witnesses to the power of the Savior to make us already participants in a Kingdom not of this world. The life of any saint is a brilliant icon of what happens when a human being becomes radiant with the holiness of God. Since our basic human calling is to become like God in holiness, we should think of the saints simply as true human beings, not as a special class somehow separate from the challenges of life in the world as we know it. It is by responding faithfully in the midst of those challenges that they become “partakers of the divine nature” by grace. The ancient practice of honoring the relics or physical remains of a saint reflects our belief that the body of a Christian is a temple of the Holy Spirit and destined for resurrection into eternal life. In the Old Testament, contact with the bones of the prophet Elisha raised a man from death. (2 Kings 13:21) In Acts, handkerchiefs and aprons that had touched St. Paul worked miracles. (Acts 19:12) It should not be surprising, then, that God continues to do great things through the relics of the saints. These are signs that His salvation concerns the whole person and conquers even death itself. In commemorating the translation of the relics of St. John Chrysostom, we must not simply marvel at the great events of past centuries. Instead, we must recognize that God calls us all to the same holiness present in the lives and relics of the saints. Like Zacchaeus, they were all imperfect people living in a world of corruption. They all endured temptations and had to struggle for healing from self-centered desire in various forms. At some point and in some way in their lives, they also repented like Zacchaeus in reorienting their lives to God as they did their best to set right what they had done wrong. Like him, they responded to Christ’s gracious initiative in welcoming His healing and strength for charting a new course. 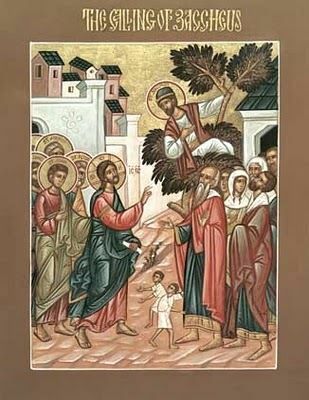 The change in Zacchaeus was profound and obvious. It involved what he did with his money and power, and definitely impacted the people he encountered every day in practical ways. He did not abandon the world, but began to live faithfully in it and to bless his neighbors. The holiness of the saints is similarly tangible. Chrysostom’s teaching, preaching, and prophetic service of the Church, for example, were clearly evident throughout his faithful ministry. If we unite ourselves to Christ in holiness, we must also become living icons of what happens when a human person encounters the Savior. He has held nothing back from us and gives us all countless opportunities to find the healing of our souls as we share more fully in His life by responding faithfully to our daily challenges. 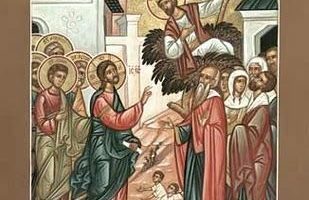 Our calling, then, is to respond like Zacchaeus, Chrysostom, and all the saints in offering even the deeply disordered dimensions of our lives to Him for healing.